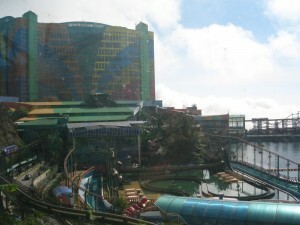 Genting Highlands… a place listed in places to visit for any tourist groups travelling to Kuala Lumpur. 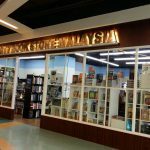 It is also the getaway for KL and nearby states folks to the cool weather. On public holidays and weekends, it is usually very crowded. 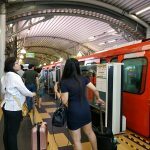 First, take the LRT train from any station. The LRT line runs from Kelana Jaya (in Petaling Jaya) and goes all the way to Gombak (Terminal Putra). 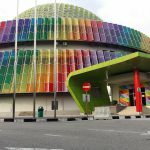 You can go up the LRT train from any stops- the more popular stops are Pasar Seni (near the bus station), Masjid Jamek (with another train line, STAR), KL Sentral (the hub for transports and linking most of the train services) or KLCC. When you get down from Gombak station, go out of the station near the place where people are waiting for feeder buses. There is a Genting bus counter there- you can purchase bus ticket- that is sold together with the cable car. I think it is below RM20, if I am not mistaken. The bus runs from hourly to two hours once- start from about 8am to 7pm. The bus will take you half way to the cable car or skyway station. Then you have to get down and walk into the skyway building- take a lift to reach the cable car station. Normally you can ask around or follow other passengers- but do not respond to tout request to take you up there by taxi or other mode of transportation. Genting runs a scheduled maintenance on their cable cars once a month and normally during off peak time. If you happened to be there when they are doing maintenance, the company will arrange other mode of transportation- like the bus will go all the way up there or you will be sent to another older cable car station (there are 2 stations in Genting). 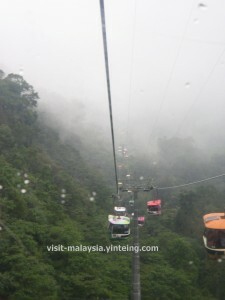 Still, I happened to be there once (I hardly visit Genting but so happened they were running maintenance)- we were sent to an older cable car station near Awana Hotel. There were long queues- so in the end, we decided to take a cab up. Once you reach the cable car base, there are many mini cable cars moving non stop- so you normally need not wait long. Still, if you go during public holidays or weekends (that is tied along with school holidays), be prepared to wait a while. 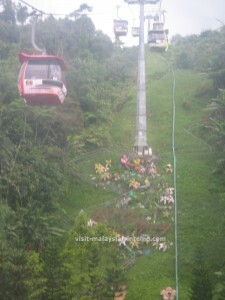 The cable car (above) will take you all the way up to Genting Highlands. The ride is about 20 minutes and you will pass over misty jungles (due to the altitude). It is quite a nice experience- I recommend that you try it. There are other pick-up points for the Genting Bus. You can refer to this website for more information. Other alternative way is to take a taxi from Puduraya all the way to Genting. There is also taxi service from LCCT Low Cost airport terminal (but it may be a bit pricey). One thing I don’t fancy travelling using the taxi is because some drivers may drive like race car drivers (which is normally okay because they have years of experience and as one of my friend said, he can even drive up to Genting with his eyes closed because he is so familiar with the roads and turns). However, because you go uphill and there are a lot of curves, if you have a weak digestive system, you may not be able to take it.